Anyone of you tried this AOA/pitot combination?
" I'm interested in your parking brake install. Really clean and functional. Please advise as to which parking brake (by number please) and which company is the manufacture. " Thanks Jim for the suggestion, will certainly try it out once flying. Never been so proud as I took my firstborn out of the hospital! CO detection is a must have in my opinion in airplanes. I' m still building, but I keep room on the panel for one. 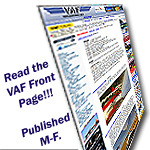 Split RV-12 and RV-12iS into two forums? I read your explanation, Randy, and do agree. Would be a wonderful idea for this beautiful forum as well: splitting RV12 ad RV12iS? Yes Red Baron, I've read about these props in Kitplanes Magazine, and am seriously in doubt to build one on my 12. Numbers would surely help! All, which prop actually is ment for the RV12? On Sensenichs site I can only find a GA composite prop ment for Lycoming engines. I thought this RV12 prop was somehow adjusted to the 912? RV-12 needs two Fuel Flow Transducers? This is very helpful! So - what IS your current K-factor (asks the builder, not yet into flying his awful machine)? I could start with that figure, for sure - better then the 18000 advised. Yes, thanks for the pic, Joeri. It's on the projects-to-make-before-I-start-on-SB list. I intend to build in a boom mount Dynon pitot/AoA: through the spinner. Hi all, wishing you and yours all the best for 2018, and many, many safe landings & happy flying hours. I did the same thing as Ron: start with the fuse first. Yep. I put it in mine. How to Find Source of Fuel Smell? I just asked a pro to weld me a tank out of 1,5mm aluminum. Will let you know the results once I have it back. I am still very, very curious for your answers to Tim's question #42: what about the Dynon ..532 boom type probe? Joe said it all. However I'd like to add one: continuïty in your time-in-shop. any of you using MGL iEFIS Lites? Willing to teach me how to get the W&B in the SIM? I put full weight and empty weight in the chart, and their two arms. I used the inside of a bicycle brake cable: some 1,5 mm flexibele wire. Couldn't believe it took some of you so bothering. For the second I spit my hands: but it went just as easy. Sorry. Great, Forum, thanks for thinking with me 'till now. Lots of searching to do. Will keep you posted! While building my '12 I sort of got in love with those rows of rivets: so straight, I just cannot cover them with paint, I think. Just what I needed. Including explanation of use. The new air vents on top of the tank are open with air (duh). I seem to be missing part# F1208A (wear-plate). I have pics of Keith's bagage box, together with measures. What coolant do I have? I'm in exactly the same process as you, Bob! Is it possible for you to email me the PDFs, please? It would be a great help!!! Great, thank you. Must've read over it. Any of you considered making a tunnel in front of the seats to carry a throttle quadrant? Are there any '12 flyers/builders in Portugal or Spain that could be met ( & flown) when in southern Portugal later this year? Anyone install pre-oiler on a 912? I'm building an E-AB 12, and intend to put an MGL panel/radio, etc in it. Now the question is: how do I connect Garmin/Dynon meant wiring to MGL? Just what I was looking for, thanks! Looks beautiful. Catto prop for RV-12 ? Has anyone of you put on a different propellor then the Sensinich that Van's advises? My flight-buddy and me just bought us an RV12 project. We collected the lot this weekend, armed with a Van's picking list. However: this list isn't alphabetical, nor numeric. My flightbuddy and me are planning to build a 12 ourselves - do you mind we come and have a peek, these days? Love to use your friends fairings, as well?